The world’s northernmost tyre manufacturer, Nokian Tyres, will in the autumn of 2015 offer European SUV drivers the world’s first winter tyre that achieves the best possible class A in wet grip and fuel efficiency of the EU tyre label. The revolutionary Nokian WR SUV 3 winter tyre, in size 265/50 R19 V, can reduce braking distances by up to 18 metres on wet roads and save fuel by up to 0.6 l/100 km. The Nokian Twin Trac SUV Silica rubber compound ensures strongest grip as well as low fuel consumption, the Nokian Aramid Sidewall technology provides excellent durability. This genuine SUV winter tyre from the pioneer in winter safety and eco-friendly driving is excellently suited for versatile use on different sports utility vehicles, such as the Porsche Cayenne, Audi Q7, BMW X5, Volkswagen Amarok, Volkswagen Touareg, Mercedes Benz ML, Jeep Grand Cherokee or Volvo XC 60. The renewed Nokian WR SUV 3 draws on the unique knowledge of extreme conditions and supreme mastery of all forms of winter that the developer of the winter tyre has accumulated. The Nokian WR SUV 3 (size 265/50 R19 V) features the Nokian Twin Trac SUV Silica rubber compound, tailored for heavy SUV use, and the Nokian Aramid Sidewall technology. They ensure that drivers facing the varying Central European winter can enjoy the industry’s finest snow and wet grip and fuel-efficiency as well as precise handling combined with excellent durability. The same technology will also be utilised in Nokian Tyres’ other winter tyres in the future. In recent years, the leading car manufacturers have been working even harder in order to promote traffic safety and to reduce the adverse effects of driving, such as carbon dioxide emissions. Even in the larger vehicle classes, such as sports utility vehicles, the future belongs to hybrid cars that are powerful but also easy on the environment. - Like the car manufacturers, our own product development is also focused on making transport safer and greener. We accepted a tough technological challenge. The new Nokian WR SUV 3 is the absolute state of the art in the tyre industry; it represents a new way of thinking that drivers can enjoy here and now, says Product Development Manager Olli Seppälä from Nokian Tyres. The extremely frugal Nokian WR SUV 3 rejects the notion that a large SUV cannot move lightly on tyres with low rolling resistance. The precise and exact Nokian WR SUV 3 is the first winter tyre for the Central European market that has achieved rolling resistance class A as a symbol of fuel efficiency. For fuel efficiency, the difference in consumption between the best and weakest tyre (A–G) is significant, at around 0.6 l/100 km. The lightly rolling tyres also reduce CO2 emissions by 14 g/km. The EU tyre label’s best possible wet grip demonstrates the tyre’s safety on wet roads. For the driver, the correct high-quality tyre choice can mean a difference in braking distance of over 18 metres, or four car lengths (difference between classes A and F). The demanding product development work comprised the careful computer optimisation and authentic testing of all the tyre components in terms of safety and low rolling resistance. The excellent winter grip and handling properties of the balanced Nokian WR SUV 3 are the result of a functional tread pattern and focused innovations combined with the completely new Nokian Twin Trac SUV Silica rubber compound developed for SUV use. The tread compound uniquely combines the Nokian Hakkapeliitta rubber compound designed for the demanding and cold Northern winter and a silica-based compound that provides excellent performance in milder weather. The end result is the Nokian Twin Trac SUV Silica rubber compound, which contains natural rubber, silica and canola oil; its unique particle distribution ensures peak performance for snow and wet grip. Due to the lightly rolling tread pattern and the higher amount of silica in the compound, the rolling resistance is extremely low, allowing the tyre to achieve lower fuel consumption and emissions than its more traditional competitors. This compound innovation also improves driving stability and wear resistance. - SUV drivers who enjoy the Central European autobahns can rely on the handling of the new product even at higher speeds, since the construction of the Nokian WR SUV 3 is very robust and sturdy, Seppälä explains. The tyre’s EU label has only one sound wave, signifying low external rolling noise. The size of this revolutionary winter product is 265/50 R19, and it carries a speed rating of V for a maximum speed of 240 km/h. SUV tyres are most often damaged by impacts to the tyre sidewall. The Nokian WR SUV 3 uses Nokian Aramid Sidewall technology to maximise impact and cut protection. The sidewall compound includes extremely durable aramid staple fibre, and it is exceptionally resistant to wear and cuts. The same material is also utilised in the aviation and military industries. Nokian Tyres is the only tyre manufacturer in the world focusing on products and services that facilitate transport in Nordic conditions. The company is known for its high-quality, safe and eco-friendly premium tyres that are carefully tailored for different markets and different demanding purposes. Over half of our product development resources are spent on testing products. 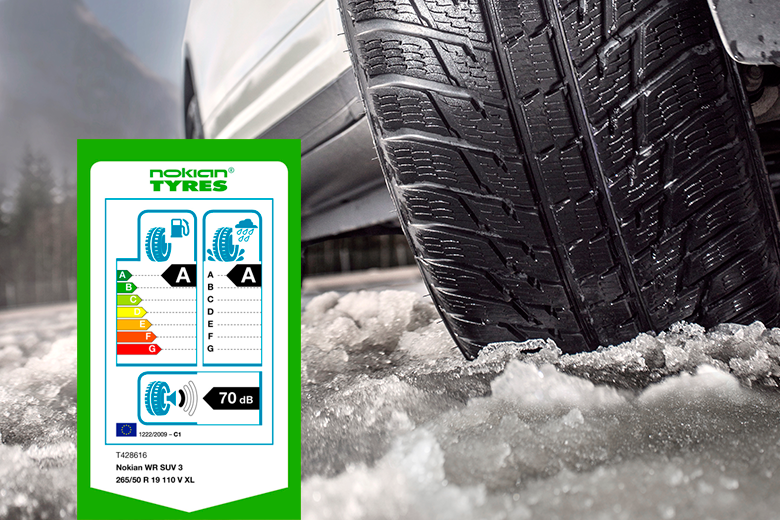 In January 2015, the company introduced a winter product that achieves the A class in the EU tyre label in terms of fuel efficiency. The new Nordic non-studded Nokian Hakkapeliitta R2 winter tyre is especially designed for BMW's i3 electric cars. The new tyre model’s size is155/70R19 84Q. The Nokian Hakkapeliitta R2 winter tyres allow owners of electric cars to enjoy up to 30% lower rolling resistance compared to the other winter tyres on the market. The energy savings gained from the lower rolling resistance increase the vehicle's range. Early this year, the pioneer in winter tyre technology also introduced the Nokian WR D4 winter tyre, tailored for the Central European market, that achieves the EU tyre label’s best A class in terms of wet grip. The extensive size selection of the Nokian WR D4 is designed for medium-sized economical family cars, and it covers sizes from 14 to 20 inches, with speed ratings from Q to W.
The company developed and manufactured the world’s first winter tyre for the winter frost in 1934. Two years later, the Nokian Hakkapeliitta winter tyre was born in the Northern winter; it is already a legend wherever true winter is known. In March 2013, we achieved a fantastic world record for the fastest car on ice, as test driver Janne Laitinen achieved a speed of 335.713 km/h (208.602 mph) on the ice of the Gulf of Bothnia. Grip and speed like never before were ensured by the Nokian Hakkapeliitta 8 studded winter tyre. Nokian Twin Trac SUV Silica rubber compound. Precise grip, excellent wear resistance, low fuel consumption The unique particle distribution of the Nokian Twin Trac Silica rubber compound, which contains natural rubber, silica and rapeseed oil, ensures peak performance for snow and wet grip. Extremely low rolling resistance results in low fuel consumption. Nokian Aramid Sidewall technology. Unique durability. The sidewall compound includes extremely durable aramid staple fibre, and it is exceptionally resistant to wear and cuts. The same material is also utilised in the aviation and military industries. The aramid fibre stiffens and reinforces the sidewall to even better withstand external impacts and pressing against the wheel flange. Tread model design. Stable driving feel, effective slush-planing prevention. The symmetrical and directional tread model (with a fixed rotation direction) optimises the stable handling and ensures safe aquaplaning and slush-planing characteristics. Strong sipes on the tread blocks provide a grip reserve. Snow Claws. Maximum grip on snow. Snow Claws were shaped on the longitudinal and diagonal grooves of the tread blocks to provide much-needed grip on winter roads. They grip the surface effectively on soft snow and soft terrain. Groove Lifts. Controlled, sturdy handling. Groove Lifts on the tread blocks next to the centre rib and longitudinal ribs of the symmetrical tread model improve handling on dry roads, making it stable and controlled. The Groove Lifts also prevent small rocks from wedging in the grooves. 3D Lock Sipe. Better handling, more durability. The 3D Lock Sipes that stretch from shoulder to shoulder improve handling in corners and during evasions. In contrast to a straight sipe, the 3D Lock Sipes also support the tread block when the sipe opens; this is due to the locking mechanism built into the sipe.